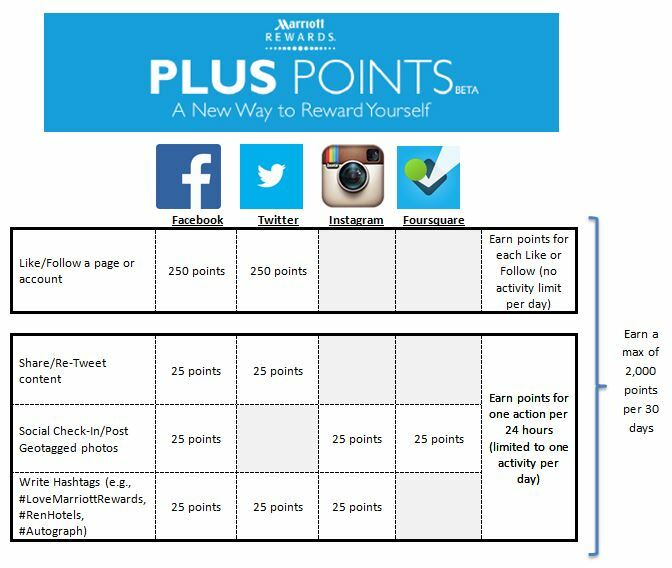 Marriot Rewards just launched a Social Media marketing campaign called “Points Plus” where customers can earn Marriott Rewards points for activity on FaceBook, Twitter, Instagram, and Four Square. Basically, you have to register your Marriott Rewards number on this page, and then connect your social media profiles. The chart below shows how many points you can earn for each different action. It appears that you can 250 Marriott points for liking a page, or following an account on Twitter. Considering that each point is worth a penny, they are paying you $2.50 to like one of their pages. Not a bad ROI if you ask me. The question is how many pages/accounts are available for you to like/follow. If it’s just the main Marriott and Renaissance profiles, then the well could run dry pretty quick. On the other hand re-tweets, social check-ins, and Instagram/Twitter posts only earn 25 points, but that can add up quickly. If you completed three per day, which appears to be the maximum then you could earn 75 points x 30 days, which is over 2,000 Marriott Rewards points in a given month. This seems like a lot of work, and I’m certainly not going to attempt to max this out, but for some it may actually seem like fun. How Do I Sign Up For Marriott Points Plus? To sign up simply go to this page and enter you Marriott Rewards number and connect your social media profiles. 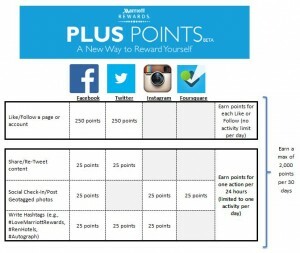 How Do I Earn Points Using Marriott Points Plus? Remember that not all brands are participating in this campaign, nor are eligible to earn points. Only Marriott, Renaissance, and Autograph Collection hotels are participating. In fact not all hotels under those brands are participating. Make sure you see this list before you post/tweet anything. Also, make sure that your check-ins and FaceBook likes include the participating Marriott property list summarized here on FlyerTalk.